In advance of 2014, blogger/author/thinker Jon Acuff issued “The Empty Shelf Challenge.” The essence of the challenge is to clear a shelf and post pics of it filling up as you read books throughout the year. There is even a special board on Pinterest for it. (I can’t for the life of me figure out how to link to a particular board from within the Pinterest app, so no link for you unless or until I edit this post from my laptop.) I accepted the challenge while at my in-laws’ over Christmas, but obviously couldn’t clear a shelf until I got home. Doh-tee-doh, it’s late January. I guess that makes it the perfect time to get around to clearing a shelf and posting my first complete read of the new year. 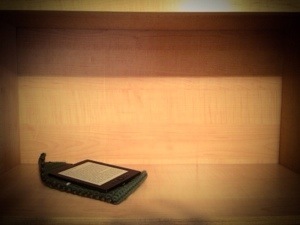 So, here is my empty shelf pictured with the Kindle I got for Christmas and the pouch my awesome wife crocheted for it. And here is my first finished book. Thoughts: I wanted to see how Andersen’s fairy tale related to The story told in Disney’s Frozen. It doesn’t. The two stories are in absolutely no way related, no matter what the credits of the movie might say. Anderson’s Snow Queen is actually pretty tangential to the story bearing her name. Her heart is “frozen,” and she tries to entrap an unfortunately willing boy. The boy’s childhood playmate, a little girl, goes on a quest to find him, and it is this girl who is the focus of Anderson’s story. Neither of these characters–nor any others, nor the plot, nor any major theme besides self-sacrificial love–make it from Andersen to Disney. Queen Elsa ends Frozen (exceedingly vague spoiler alert) embracing the fact that people love her and she does not need to fear their rejection or hatred, and so she is able to wield her power to the benefit of her kingdom. Tim Burton and Quentin Tarrintino would have to be brought in to tell a story dark and twisted enough to turn Elsa into Andersen’s Snow Queen. That is not to say that I didn’t enjoy Frozen. I loved it. It’s the best thing Disney has produced in house for quite a while. It’s also the one of the clearest depictions of what “true love” is about. 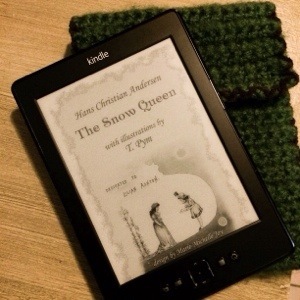 In it’s own right, The Snow Queen is…well…weird. The timescale is weird. It touches briefly on a wide range of topics in a weird way. Parts of the story are weirdly dark. Nevertheless, it’s a fascinating kind if weird. This work is “fantastic” in the older sense of the word. Reality is bent away for the sake of telling a story that is somewhat allegorical and begs to be referenced. It was, by no means, what I was expecting; however, I enjoyed experiencing it, weird as it was. Let me be one of the first to wish you a happy new year, a new school year that is. Next week the school-age citizens of our area will be returning to the hallowed halls of learning. Along with that return, everyone else’s lives will lock back into a steadier routine. Coworkers won’t be off on vacation, parents won’t be desperate to find daily activities to occupy their offspring, children won’t be out playing in yards throughout the day, teenagers won’t be hanging out until one day fades into the next–for the most part. Whether you have kids or not, the school year affects all of us as surely as a rising tide raises all boats. The return to school always brings up one question year after year. What did you do with your summer? It’s the title of an essay for every student at some point: “How I Spent My Summer Vacation.” Did you go anywhere? Did you have any adventures? Did you accomplish any goals? Did you read any good books or see any good movies? Did you work your tail off because in your vocation summer is a busy season? What have you got to show for the last couple months of your life? Now for the pastoral twist. Ephesians 5:15-17 says, “Look carefully then how you walk, not as unwise but as wise, making the best use of the time, because the days are evil. Therefore do not be foolish, but understand what the will of the Lord is,” (ESV). Did you make a wise use of your summer, and did you ask God on the front end how He wanted you to spend it? If you are like most people, you probably didn’t stop to consider what God thought of your vacation plans, your summer reading, or your bathing suit. And there’s a lesson there; Christians aren’t supposed to be just like everyone else. In context, that is precisely what Paul is pointing out in Ephesians 5. He even begins this section with the audacious instruction to, “…be imitators of God, as beloved children. And walk in love, as Christ loved us and gave himself up for us, a fragrant offering and sacrifice to God,” (Eph. 5:1-2, ESV). Now as worthy a point as that is, there is a greater one yet. Do you realize that you will be held accountable before God for how you spent, not just your summer, but every moment of your life? Do you realize that he finds how you have spent and will spend much of your time to be an infinitely offensive evil against His holy character? But thank God that “Christ loved us and gave himself up for us” so that we might stand in his infinite righteousness before God. Being both sinless man and infinite God, Jesus was able to satisfy God’s wrath against our sin and restore to a right relationship with Himself all who will repent (turn away from sin and self-righteous attempts to be “good enough”) and believe in Him. So the real question isn’t “What did you do with your summer?” What is important is this: What have you done with Jesus? First, I need to make a confession. On Thursday, Dec. 20, I had had too much caffeine as I made a long drive home, and so I found myself struggling to fall asleep as midnight approached. I’m ashamed to admit that with the wind howling outside, I caught a slight case of the heeby-jeebies considering the irrational thought that just maybe the Mayans were right about some impending cataclysm. I tell you this as a set up to explain why I knew better and to show what this all has to do with Christmas. After the flood, some 1700-ish years after creation, God made a promise as he enjoyed the sacrifice Noah made having been brought with his family out of the ark. God destroyed and remade everything through the flood. He restarted the spread of humanity over the earth by showing grace to one man and his family and saving them from the flood. He promised Himself that He wouldn’t repeat this kind of destruction, even as He recognized that mankind is inclined toward evil from the start. So the Mayans couldn’t be right because the whole idea of their calendar is based on a cyclical view of time–destruction and recreation without end–while the Bible reveals that time is linear with a beginning and always moving forward to the end God laid out before He began it all. But what’s that got to do with Christmas? Mankind is inclined to evil, lawlessness, disobedience to God, sin. This is because everything reproduces after its own kind, and when Adam sinned and broke his relationship with his Creator he became a sinner only able to reproduce more sinners. However, after the fall of man as God was cursing the serpent (on His way to cursing the woman and the man), God gave a promise saying, “I will put enmity between you [the serpent] and the woman, and between your offspring and her offspring; he shall bruise your head, and you shall bruise his heel” (Genesis 3:15 ESV). “Offspring” here is literally “seed.” Here is the first hint at the coming Messiah, that a man would come born of the seed of woman–men have “seed”, women do not, so this is unique and puts this offspring of a woman outside the line of inheritance of the man such that this one to come is not bound by sin. And He will be struck by the serpent, but He will strike the serpent with a devastating blow to the head. Do you see Christmas yet? Man was made in the image of God to rule creation to the glory of God and to fill all creation with The image of God to the glory of God. And all of creation was spoken into existence by the word of God, and the way creation is ordered was spoken into order by the word of God. And now, it’s Christmas. Before He was the baby in Bethlehem, He was the eternal Word of God. After Bethlehem he grew into a man who died as the perfectly sinless Lamb of God who takes away the sin of the world through his death on a Roman cross at the hands of the Jewish religious and popular leadership. After the cross, came the grave. And–glory to God–after the grave, came the resurrection! You can visit the place we’re pretty sure Jesus was born, but you can’t visit his tomb. He’s not there and no one cared to preserve it. He’s coming again, and of that coming no one knows the day or hour, certainly not the Mayans. Will you be ready? We’re 2000 years closer, and He said He’s coming soon. Are you prepared for the real end of this world?